John A. 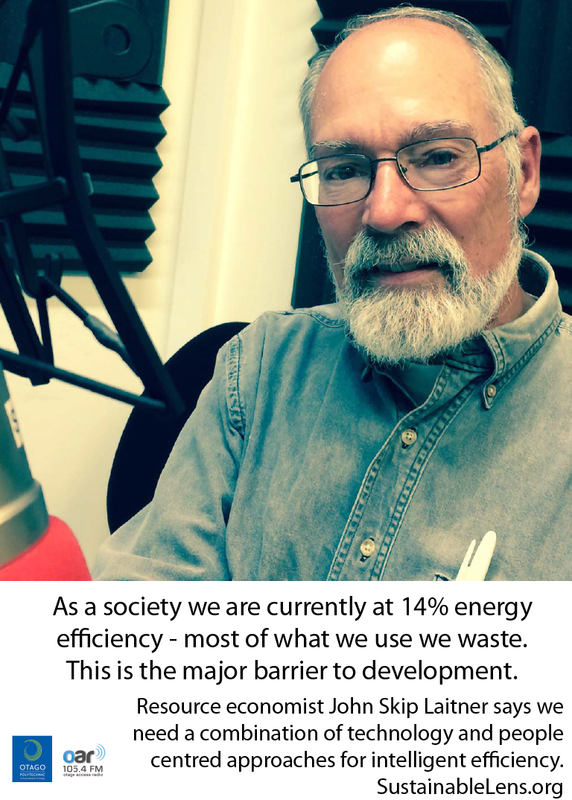 “Skip” Laitner is a resource economist. He currently leads a team of consultants ‘Economic and Human Dimensions Research Associates’ based in Tucson, Arizona. He was a senior economist for technology policy at the U.S. Environmental Protection Agency for nearly 10 years, where he won EPA’s Gold Medal award for his contributions to economic policy analysis for that agency. More recently, he led the Economic and Social Analysis Program for the American Council for an Energy-Efficient Economy (ACEEE), a well-known think tank based in Washington, D.C. Recent publications include The Long-Term Energy Efficiency Potential: What the Evidence Suggests. and with colleague Karen Ehrhardt-Martinez, People-Centered Initiatives for Increasing Energy Savings. To continue to develop globally we need to double the amount of necessary energy. We’re not talking about a return to the stone age – in fact the opposite. We’re talking intelligent efficiency. (why has the market not already fixed this?) we need to shift to a focus on the cost of energy services. This is an opportunity for new business models – the sale of services, including selling efficiency gains. Why are people fretting about the budget of a city council at $200 million, when the same city is spending $500 million on energy and wasting most of it? The measure of fuel poverty is spending 10% of your household income on energy. If a city is spending more than 10% of its GDP on energy – the city is in fuel poverty. The energy internet gives us the shift in communication and a new form of energy that was the basis of the first two industrial revolutions. Now instantaneous 2-way communication and distributed energy resources mean we can move from a commodity based economy to a service based economy. Improvements in technology will only take us so far – the real systems changes are people-centred. We’ve a long way to go to help people understand how vital energy is, and how very central it is to our very economic and social well-being. We tend to think of energy as an afterthought when it really needs to be brought forward into the mainstay of how we live as a society, how we get to work as an economy. We can save 10-15% on energy use in their home by paying attention – that’s a smart thing to do, but to really do it at the scale that we need and at the depth we need, we’ve got to do it as a community. but we need way more than that – we need to do it as a community…it’s more than everyone changing their lightbulbs – though we need that too – we need system changes. We need everybody understanding that the well-being of the community really depends on succeeding on this task of energy efficiency, and thinking through new business models that need to be brought forward to make it happen.